This is a new, streamlined introduction to the ACME EDM experiment, which is an experiment I’m working on as part of my PhD in physics at Harvard University. The following are strictly my own personal views and should NOT be taken as representative of the ACME collaboration. I am only writing this as part of my personal hobby of communicating science to the public. The official website of the ACME collaboration is here. Any official or media inquiries should be directed to the principle investigators of the experiment, who are contactable at acme AT physics DOT harvard DOT edu. What is the ACME EDM experiment? What do we do? When one hears the word “acme”, what might come to mind is the Acme corporation in the Road Runner/Wile E Coyote cartoon series. Wile orders all kinds of products from the company to trip Road Runner, but these products almost inevitably fail. 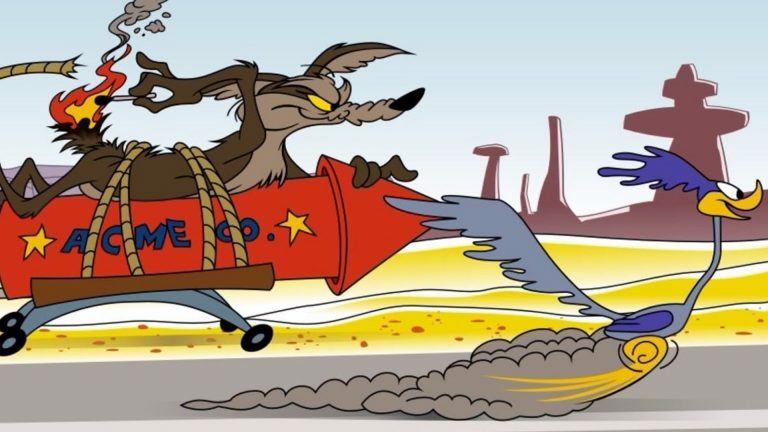 Wile E. Coyote chasing Road Runner with an Acme-made rocket. On the other hand, the word “acme” originally meant “highest point” or “pinnacle”. So the way it is used in the Road Runner cartoon is sort of ironic. In a way, both of these descriptions are relevant to the ACME EDM experiment. Like the fictional Acme corporation, we have a singular mission and we are willing to use whatever means necessary to get there. But like the original definition of “acme”, we aim to be the best type of experiment there can be. We pay tribute to our link with Wile E. Coyote in the cover page of our official website. What does ACME EDM do? ACME EDM stands for “Advanced Cold Molecule Electron Electric Dipole Moment”. First of all, we care about electrons. These are tiny fundamental particles that carry negative electric charge. They are responsible for the transfer of electricity. Together with protons and neutrons, they constitute most of the atoms of matter – or “stuff” – you are seeing around you right now. 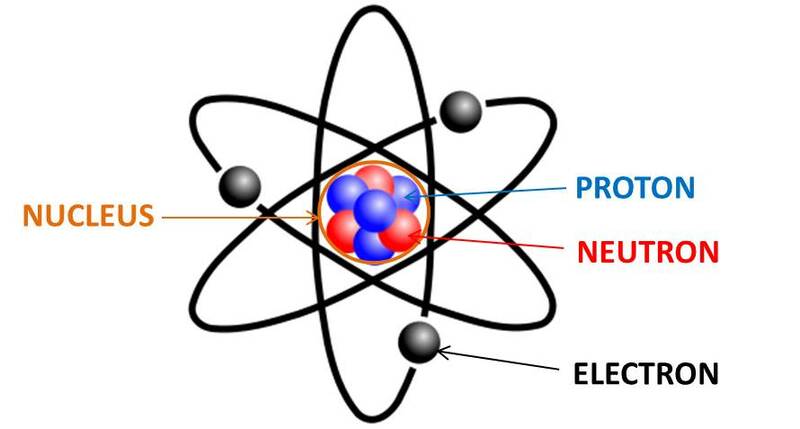 The iconic classic image of an atom, the fundamental constituents of all physical things. We are looking at electrons – the tiny charged particles orbiting the nucleus of neutrons and protons. On the left: if the electron EDM is zero, then it is perfectly “round”. Right: if is non-zero, then the electron will have a slight “bump”. Why do we care about the electron EDM? Because it can potentially help us to explain the origin of all matter! In particular, the value of the electron EDM can shine light on the problem of matter-antimatter asymmetry. In short, we know that besides the ordinary matter around us, there’s a similar form of matter called antimatter, which has the same properties as matter but with opposing charge. For example, electrons have an antimatter counterpart called positrons, which have the same mass and spin as the electron, but its charge is positive instead of negative. Because of this symmetry between the two types of matter, nobody really understands why during or after the Big Bang, more matter was produced than antimatter. What should have happened is that equal amounts were produced, the matter would mix with the antimatter and annihilate themselves. We would be left with an empty universe consisting of just photons. Of course, the reality is that our universe consists of more than just photons. So, there must be some asymmetric processes that produced more matter than antimatter.2 The problem is, we don’t quite know what those asymmetric processes are and how they manifest in nature. But most people believe they must be there. Figure by Aparna Nathan of Harvard, taken from my recent SITN article. The above panel shows the universe without asymmetric processes that produce more matter than antimatter, resulting in an empty universe consisting of pure photons. 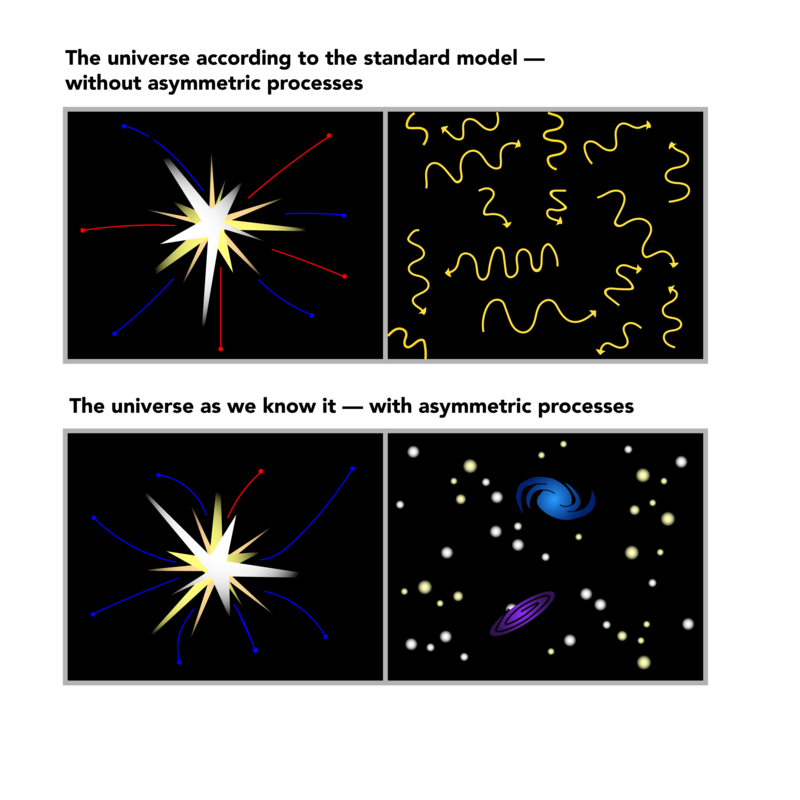 The bottom panel shows a universe with asymmetric processes, allowing matter to “win out” over antimatter, creating planets, stars, and galaxies that we see today. How does this link back to the electron’s shape? The answer is that in many theories which posit these asymmetric processes, the electron gives rise to a non-zero EDM. This is because the asymmetry in these processes (termed CP violation) is the same kind as that in an electron that had a non-zero EDM. So, investigating whether the electron EDM is zero or not will help tell us if these theories are right. Finding a non-zero EDM will contribute an important piece of the puzzle towards understanding how all matter originated. How does the experiment measure the electron’s shape? We’re trying to measure the shape of an electron’s charge distribution. The obvious way to do this is by taking an electron and trying to observe its behavior in an electric field. The stronger the applied electric field, the better we would be able to see its behavior. But that’s impractical for technical reasons. So, what we do is we observe the properties of an electron orbiting a molecule. The name of the molecule is thorium monoxide or ThO. How precise are you guys measuring the electron? The ACME II measurement, which just came out in late 2018, had a precision of . This looks like a very small number, but may be easier to visualize in the following way. Although nowadays particle physicists think of the electron as a point particle (i.e. it has a size of zero), it is often helpful to think of it as a classical particle: a small ball with a non-zero diameter. It’s a very small ball: about meters, or a 100 billion times smaller than a human hair. Now imagine if we blow up the electron such that it is the size of the Solar System, defined by the orbit of Neptune, which is 4.545 billion kilometers from the Sun. This is an immense distance: the space probe Voyager II, traveling at 16 kilometers per second, took 12 years to reach Neptune. Even after this unfathomable blowing up of the electron’s size, the ACME II measurement would still be able to detect a millimeter deviation – the size of the smallest increment on most metric rulers. This really brings out the precise in precision measurement! What has ACME found so far? As of October 2018, ACME has gone through two generations of measurements (2014 and 2018). In both instances, we improved on the precision of the previous measurement by an order of magnitude. The experiment found that the electron was perfectly round. This is consistent with almost 70 years of measuring the electron EDM, which I have documented in this series starting here. This result continues constrain the range of possibilities for new physics beyond the Standard Model of particle physics. Some simpler versions of supersymmetric theories, for example, are untenable. Also, the fact that no electron EDM has been found at this level makes it less likely that the Large Hadron Collider will find any new particles. The ACME experiment is far from finished. There are still ways to improve the measurement, and that is the focus of my PhD research for the next few years. Stay tuned and watch this space!